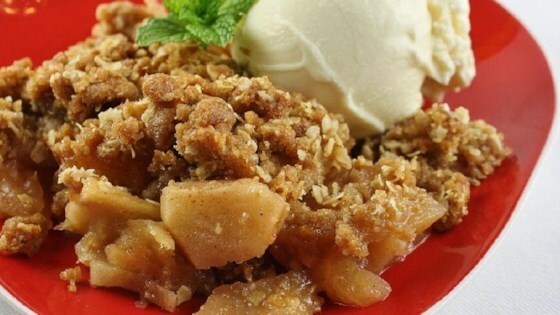 "This is the best dessert for the early fall when the sweet and firm apples are just in season. Use the best quality cinnamon you can get and get it from a spice merchant or even a store where you can get it bulk; it does make a difference. Within ten minutes of going in the oven the scent will fill the house and neighbors you loaned things to years ago will return them just to invite themselves in and wonder aloud if there is any left (Note: there isn't). Optional accompaniments would be caramel sauce, ice cream, and whipped cream." This was so dry. I made it exactly as written. Tried this tonight & it was really good! I am a novice & I was able to do it.